Each and every process, on our end, that goes into creating Beach Access’ beautiful swimwear and ‘Island Essentials’ collections, would be nothing without the skill and hard work of the people we source from in Bali, Indonesia. We chose Bali for several reason, and it had it’s pros and cons, as we discussed in our last blog post; “From Bali with love”. Read it here. This blog post, “Rika + other local artisans”, is a simple homage to those local people who’ve used their hands to bring our designs to life. Rika, showing off her hard work. These hand-sewn ‘Waves’ + ‘Palms’ scrunchies are made from left-over fabric from our Rattan bags. Rika is a tailor, who we met on the roadside in the south of Bali. At the time, we were driving along the main road on a moped looking for a tailor or alterations place that could help us to simply sew our fabric labels onto the hats and bags that we’d had made for our ‘Island Essentials’ collection. We stopped out the front of Rika’s shopfront, a humble hole-in-the-wall tailor and alterations operation run by her and her husband. She was very smiley and happy to help us with the sewing. They did an amazing job, so later in the year we took a bunch of the left-over fabric from our Rattan bags, to have them turn it into hair scrunchies. Waste-free and supporting local small businesses like Rika and her husband feels good, for us and for you! Unfortunately, we didn’t think to capture much of the process before Rika made our scrunchies. We promise to do so for our 2019 collection, so we can share it with you. It’s cool to see exactly where the stuff you’re wearing came from, and even cooler knowing it came from a good place. 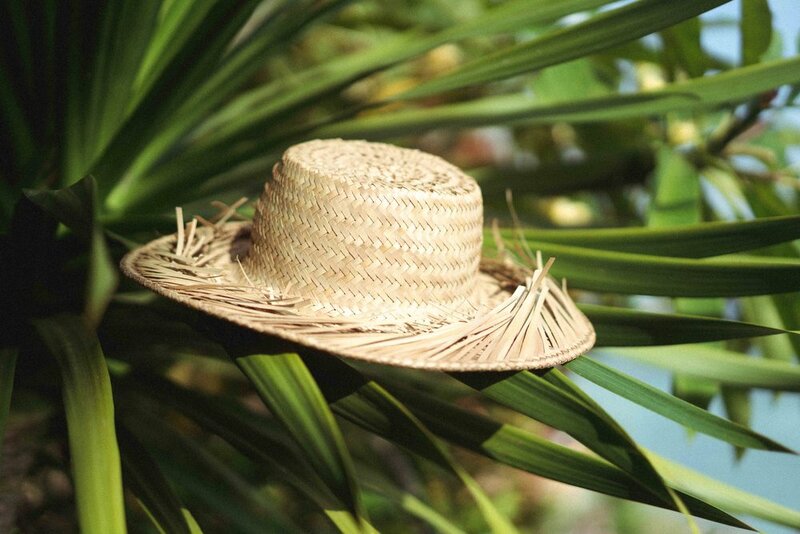 Imagine the skill and patience required to hand-weave the intricate details on our ‘Sun’ Hat. Same for the ‘Tide’ Bag. It’s a hand-woven miracle! There are so many steps to create our beautiful rattan bags, like the ‘Castaway’ Rattan bag. The Ata grass must be grown, then harvested. The Ata grass is dried and woven into traditional shapes. The bag is smoked over a coconut husk fire, to hold it’s shape and create the beautiful color. The fabric inlays sewn inside and finished with our Beach Access fabric label.